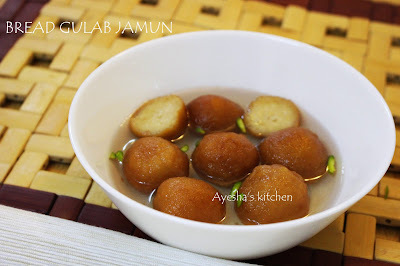 Hi foodies...Here am sharing the recipe of a simple quick instant bread gulab jamun recipe with the only ingredients bread slices and milk. It is the quick alternative to the regular gulab jamuns. A very delicious yummy recipe with bread. Once we tried gulab jamun with bread, we never go for any other gulab jamun recipe. It's too simple and perfect. These bread jamun will surely make your tummy yummy. Once I tried one of my friend's recipe for bread gulab jamun and it was a great failure as she added baking powder, ghee, milk powder and all to make a smooth dough. When I fried it, u know what happened??? The balls melt in the oil...OMG....i feel very sad but never lose my hope... SO REMEMBER AND CAREFUL...Do not add any other ingredients other than bread and milk as the bread has all those in it. Finally, i got a recipe which is truly trustworthy and never fail recipe. 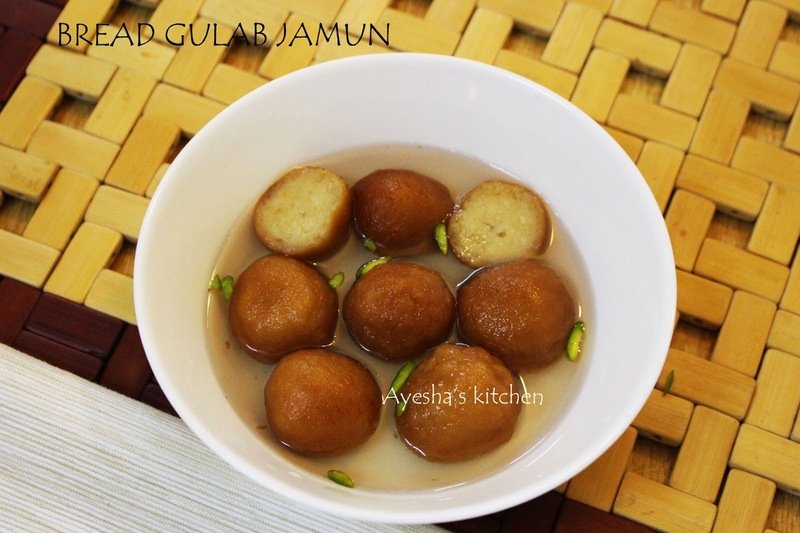 Gulab jamun is a traditional dessert, popular in countries of South Asia. It is mainly made from milk solids, and traditionally from freshly curdled milk. Homemade gulab jamun is usually made with milk powder, a pinch of all-purpose flour, baking powder, egg and butter which is kneaded to form a smooth dough, mold into small balls, deep fried and then dropped in warm sugar syrup. First, we have to prepare the sugar syrup, as the fried jamuns are dipped in sugar syrup immediately after frying. So make the syrup by boiling sugar and water together in a deep pan and when boiling add lemon juice, cardamom powder, make the flame to very low and again boil for few minutes stirring occasionally. When it reaches one string consistency, switch off the flame. Set aside. In a bowl, crush all the brush with hand. Add 2 tbsp of milk to it first and mash it lightly. Add milk little by little accordingly to make a smooth dough. Do not add more milk, knead to a smooth dough by mixing well. Take a small portion of the prepared dough(a small lemon sized) and make small round balls. It must be smooth without cracks. If cracks, u must knead the dough more. Make all balls the same way. Heat oil in a pan. The oil must not be too hot, as it will result in a hard jamun. So heat oil over a medium flame, then lower the heat, add the balls, fry for 2 minutes on a low flame, increase the flame to medium heat and then fry it until golden. Make sure that the balls are fried evenly and you must turn the balls continuously while frying for the perfect jamun. The perfect simple bread gulab jamun ready.